AVID Entertainment hits the ground running with the first release on its new imprint Avid Roots. Here we are searching for the very roots of Bob Dylan and find them in the work of the legendary singer Woody Guthrie and one of his earliest disciples Ramblin Jack Elliott. 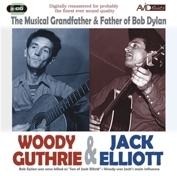 The story of the young, unknown Dylan visiting the dying Guthrie in hospital is the stuff of legend and it is certainly obvious to those with ears that Woody handed over the key to the talking blues to the young pretender! And maybe Ramblin Jack showed him some different ways to turn it! If you have been impressed with the young Dylan of Talkin New York Blues; 'Bob Dylans 115th Dream' ; 'Talkin World War 111 Blues' ; 'Talking Bear Mountain Picnic Massacre Blues' or 'Talking John Birch Paranoid Blues' or indeed anything the great man has done then you need to listen to the men who helped make it all possible..... Woody Guthrie and Ramblin Jack Elliott!